U.S. News & World Report ranked Wright State University’s doctoral engineering programs No. 146 out of the 206 schools included in their 2019 National Universities rankings. Wright State University's Ph.D. in Engineering Program is an interdisciplinary collaboration between three departments within the College of Engineering and Computer Science: the Department of Biomedical, Industrial and Human Factors Engineering, the Department of Electrical Engineering, and the Department of Mechanical and Materials Engineering. Students conduct dissertation research in one of seven research focus areas. Focus areas draw on faculty resources throughout the college. Our coursework also uniquely transcends the boundaries of traditional engineering disciplines, creating an educational experience that serves as a strong foundation for exciting, rewarding research and development careers in industry, government, and academia. Much of the research being conducted in the Ph.D. in Engineering Program is interdisciplinary in nature and focused on solving "real world" problems through synergistic relationships with industry and government. Program faculty members collaborate with industrial partners and government research laboratories in discovering fundamental knowledge in various engineering fields. Recent and current sources of research support include federal agencies, military agencies, and local industries. Research sponsors include Anteon; Delphi Chassis Systems; Lexis-Nexis; MRLets Technologies, Inc.; NASA; NSF; OAI; Pfizer, Inc.; Procter & Gamble; Systran Federal Corporation; U.S. Air Force; U.S. Department of Energy; U.S. Navy; Universal Technology Corporation; and Veridian Engineering. Research at Wright State is not limited to on-campus facilities. Several industrial laboratories, Wright-Patterson Air Force Base laboratories, the Air Force Research Laboratory at Wright-Patterson Air Force Base and the laboratories of other local and regional universities are involved in joint research efforts with Wright State University. Nicholas Ballester used his two engineering degrees from Wright State to land a job with a company founded and run by medical doctors. After earning his Ph.D. in materials engineering from Wright State, Brian Joyce launched a successful metal-testing company. 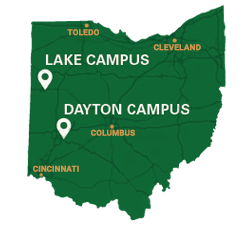 Interested in visiting the Wright State University campus for more information on the Ph.D. in Engineering Program? Contact the Program Director for more information. Your hard work has created some unique opportunities for you — and the Ph.D. in Engineering program at Wright State University is all about opportunities. The Miami Valley region of southwest Ohio contains one of the highest concentrations of engineers and scientists anywhere in the world. Wright-Patterson Air Force Base and the Air Force Research Laboratory are located, quite literally, in our own back yard. The Ph.D. in Engineering will not only place you in this community, it will position you to be one of its thought leaders. More than 115 employers provided Wright State internship sites in 2016-17. Students collaborate on research projects at local corporate partners that include AT&T, Ball Aerospace, and Dayton Power and Light. Through the Dayton Area Graduate Studies Institute, you will have access to leading research experts from other universities, government, and industry. Your opportunities at Wright State will extend beyond graduation. Our engineering graduates are employed locally and around the world at the Air Force Institute of Technology, Emerson Climate Technologies, InfoSciTex, LexisNexis, the National Air and Space Intelligence Center, Reynolds and Reynolds, and many more. Our graduates fill roles in all sectors including industry, academia, and government. The College of Engineering and Computer Science at Wright State is known for its innovative engineering mathematics educational model, and that spirit of innovation extends to its doctoral programs. You will pursue a world-class education and innovative research that crosses the traditional boundaries of engineering. The expertise of our faculty members — many of them leading researchers in their fields — and the university’s interdisciplinary approach to education will give you the breadth of knowledge you need to excel. Please visit our campus soon. Contact me or any of our faculty members to explore research interests. I am confident you will feel at home here and will see why we feel so strongly about engineering at Wright State. Thank you for visiting our website and for your interest in our doctoral program in engineering.